Hey cool! There will be football in 2011! Oh, it’s just week 17 of 2010. The game is meaningless for the Pats, but since they have a bye week next week I suppose we should watch anyways. It’s always fun to watch the Dolphins try to cope with cold weather. And of course it is another matchup between Belichick and Parcells. What? Parcells left? He gave up on a team in midseason. Huh. Never would have expected that from him! We’ll go with some summery Mango Curry Chicken to fight the cold. Combine the mango, coconut milk, and spices in a blender and blend well. Pour over the chicken in a large ziplock bag and refrigerate overnight. If using wooden skewers, soak them in water for at least 10 minutes before putting them on the grill. Put one chicken tender on each skewer. And cook over medium-high heat for 10-15 minutes. The weather will be bad so let’s get into a variety of strong ales. The English Barleywines and Old Ales and their American cousins. Barleywine is a term applied traditionally to the strongest beers, implying that they were beers with the alcoholic strength of wine. It is true in some cases, but in some of the English examples the alcohol can be as low as 7%. American Barleywines are usually stronger than English, running at least 10% up to 12%-13% and even higher for the rare example. They also tend to be a lot hoppier than the English examples. There is a fine line between American Barleywines and Double/Imperial IPAs. The difference being in the body – fuller in a Barleywine due to lower attenuation, and this gives a Barleywine more of a balance between malt and hops than would be found in a Double IPA. Barleywines can be kept for years and will change over time. Hops will fade, alcohol will mellow and oxidation will occur. Due to the large amount of barley used to get the ABV so high, barleywines will usually be at least amber in color. They may get as dark as brown but are never black. Old Ales (the English term) and Stock Ales (the old American term) are very similar to Barleywines but in the past would have been aged before they were sold. The English versions can also be surprisingly low in alcohol, sometimes barely passing 6%. American versions are usually at least 7% and tend to be stronger, overlapping well into Barleywine territory. These styles are more similar than they are different, despite the different names. Many barleywines are named “Old” to further blur any distinctions. Expect a strong beer, often with fruit flavors and aromas from fermentation. Body will be full, the alcohol should be noticeable and may be hot especially in unaged beers, but never solventy. American styled barleywines will have all of the citus, pine and reinous qualities you’d expect in a strong IPA. Both English and American styles barleywines can have caramel and toffee flavors from the darker body building malts used. 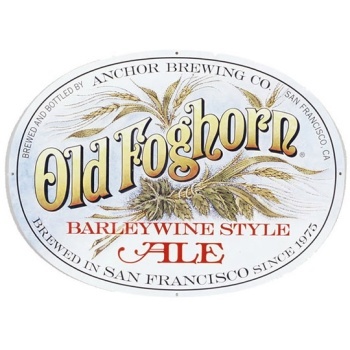 The first commercially brewed Barleywine in America was Anchor Old Foghorn. Introduced in 1975, this approx 9% beer is more of a traditional English style. Sierra Nevada also makes a barleywine, and as if often the case between Anchor and Sierra Nevada where Anchor reintroduces an old traditional style, Sierra Nevada reinvents it as American. Sierra Nevada Bigfoot 9.6% ABV and 90 bitterness units from all American hops. Brooklyn Monster at 10.3% and brewed with Scottish and English malts, this is a strong version of the English style. Rogue Old Crustacean around 10% and over 100 bitterness units. This American style barleywine is packaged in small 7 ounce nip bottles. Harpoon Leviathan Barleywine is their current Leviathan seasonal, a distinct line of stronger beers. 10% ABV and brewed in the English style. Sam Smith Yorkshire Stingo, is a 9% oak aged beer. Stingo is one of many old names for Barleywine/Old Ale. Fuller’s Vintage Ale also comes out around 9% and is only produced once a year and is vintage dated for aging. Berkshire Holidale is a traditional English style Barleywine at 8.5%. Berkshire also puts out a raspberry barleywine in about a month. A fruit beer that beer lovers can enjoy. North Coast Old Stock Ale is an Old Ale in the English style, brewed with all British ingredients. However it is much stronger than most English examples at 12.5% ABV. Great Divide brews Hibernation in the Old Ale style, 8.7% ABV, and Old Ruffian in the Barleywine style at 10.2% ABV. Having both would help break down the differences between these 2 closely related styles. However there are other breweries that would call Hibernation a Barleywine instead of an Old Ale. Dogfish Head Olde School is an American styled Barleywine, and is one of the strongest at 15% ABV. That is close to twice the ABV of some English Barleywines and quite a few Old Ales. Technically it is a fruit beer as it’s made with dates and figs. Dogfish Head also puts out a beer called Burton Baton. Burton ale is an archaic British strong ale style. Their version is a blend of an Imperial IPA and an Old Ale, making it closest to an American Barleywine. Heavy Seas Below Decks Barleywine is a 10% ABV English styled beer designed to be aged. Part of Heavy Seas’ Pyrate Fleet of strong beers. Rock Art from Vermont makes two barleywines. Ridge Runner at 7% ABV is closer to the English style. Vermonster, at 10% is more of an American barleywine. Rock Art had to fight for the name “Vermonster” in court when Monster energy drinks tried to use money and legal threats to gain rights to a name Rock Art had prior use rights to. Rock Art also makes an Old Ale named Stock Ale, ‘Stock’ being another archaic name for a beer meant to be stored/aged. Young’s Old Nick, isn’t listed on the Young’s Brewing website, but it is still imported. One of the most traditional English barleywines at only 7.2% ABV. Southern Tier Backburner about 9% in the English style. This is a February release, but beer releases seem to happen earlier and earlier each year.